The transduction of light quanta into an electrical signal is not understood. However, in several arthropod photoreceptors this transduction process was shown to be associated with the appearance of discrete waves in the membrane potential, the so called ‘quantal bumps’ (in Limulus: Yeandle, 1957, and Adolph, 1964; in locust: Scholes, 1965; in the fly, Musca: Kirschfeld, 1965; in Drosophila: Wu and Pak, 1978). In the Limulus photoreceptors, where the quantal bumps were first observed, it was shown that the receptor potential is the superposition of the elementary responses which are initiated by the absorption of single quanta (Yeandle and Fuortes, 1964; Dodge et al, 1968). 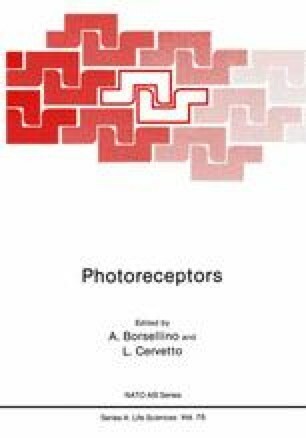 Wu and Pak reached similar conclusions for Drosophila photoreceptors (1978).